I routinely (some would say repetitively) argue that the burden of government spending is a drag on the economy because labor and capital are being misallocated via the political process. My message is that we need to reduce the size of the public sector, even if we do it in a very gradual way by imposing some sort of spending cap that fulfills the Golden Rule requirement of having government grow slower than the productive sector of the economy. That being said, a modest short-run agenda doesn’t mean we shouldn’t have bold long-run goals. So while I’m glad the Tea Party has helped restrain government spending in the past two years, that’s just an interim step. And I’m all in favor of bringing federal government spending back down to about 18 percent of GDP, which is where it was when Bill Clinton left office. But why stop there? Wouldn’t it be better to dramatically shrink the public sector? That approach certainly would be consistent with what our Founders wanted and with the first 150 years of our nation’s history. I shared some remarkable data last year showing that the public sector used to be very small. Not just in the United States, but other nations as well. Indeed, government spending (at all levels) consumed less than 10 percent of economic output in the world’s leading nations in 1870. And even as late as 1913, the public sector only consumed an average of about 12 percent of GDP in those major western nations. So why has government become much larger in the past 100 years? The answer, as shown by this remarkable chart prepared by Vito Tanzi, the former Director of Fiscal Affairs at the International Monetary Fund, is that the welfare state has exploded. As you can see from the table, there was almost no welfare state at the beginning of the 1900s, and redistribution spending was minimal even as late as 1930. 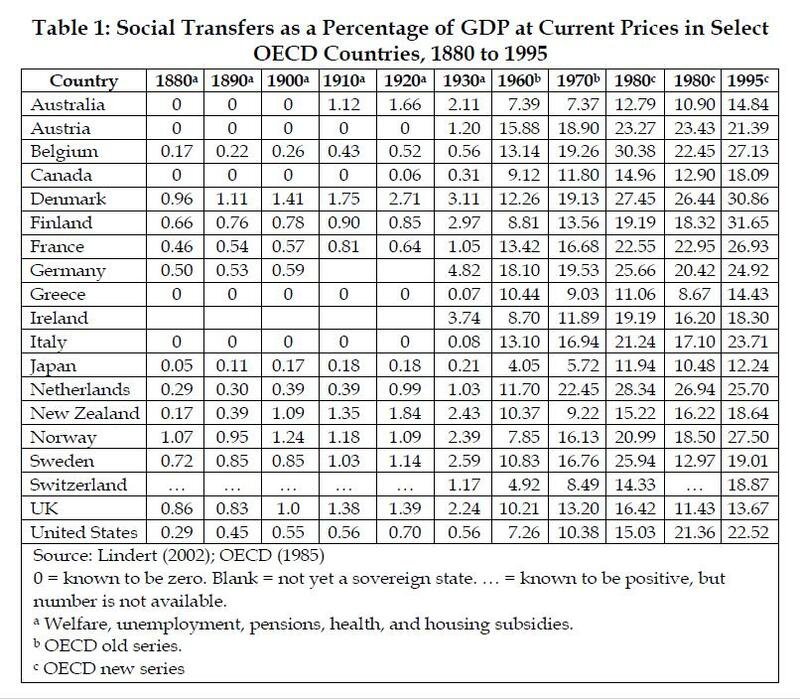 But welfare-state outlays, referred to as “social transfers” in the table, have ballooned over the past eight decades. And if you’re a glutton for bad news, you should also understand that BIS, OECD, and IMF data predict major long-run troubles because entitlement programs are going to become an even bigger burden in the future. In other words, we’re already in a deep hole because the welfare state has radically expanded, and that hole will become much deeper in almost all nations in the absence of genuine entitlement reform and effective caps on so-called discretionary spending. Fortunately, we can make progress. Perhaps not in the next couple of years with Obama in the White House, but spending caps and entitlement reform are possible at some point in the near future. Simply stated, the ongoing fiscal crisis in Europe is causing more and more people to understand that we can’t remain on the current path. Our ultimate goal, however, should be shrinking government even further by restoring the Constitution’s limit on the size and scope of the federal government. Maybe I’m a Pollyanna, but I’m glad to be at the Cato Institute where I can strive every day for this vision of a freer and more prosperous America. P.S. We should undo the welfare state not only because that reform would be good for taxpayers, but also because the so-called War on Poverty is bad for poor people. Redistribution creates long-run dependency because of a poverty trap that makes it more difficult to climb the economic ladder. If we really want to help the less fortunate, private charity does a far better job – and Americans (unlike Europeans) still have the genuine compassion that exists when you spend your own money. P.P.S. If you want a humorous look at genuine compassion, Libertarian Jesus has some wise advice. If you want to cut wasteful spending then the disability program must be reformed radically!!! If you really want to cut wasteful spending then why not shut down Dept of Housing and Urban Development, Dept of Education and SBA? We need to stop wasteful government spending by privatizing the post office!! Bill Clinton rightly noted that we should lower our corporate income tax in the USA!!! The Founding Fathers did not want the federal government to grab power from local governments!!!! The House of Representatives Appropriations Committee marked up the Commerce, Justice, Science, and Related Agencies Appropriations Bill for fiscal year 2014 last week. While the bill still allocates too much funding for activities that are duplicative or inappropriate for the federal government to undertake, the committee did get something right: It eliminated funding for the failed Office of Community Oriented Policing Services (COPS). 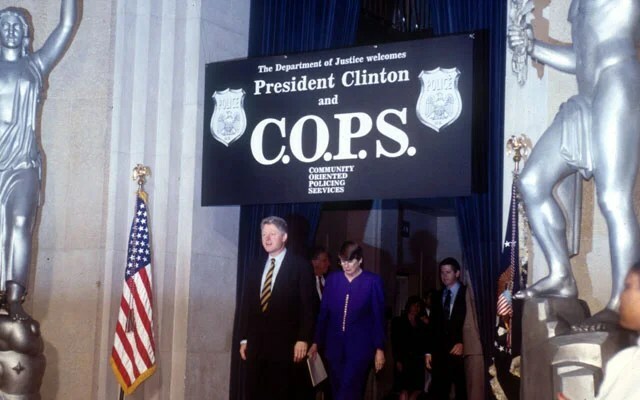 Created in the middle of President Bill Clinton’s first term, COPS promised to add 100,000 new state and local law enforcement officers on the streets by 2000. Research by The Heritage Foundation has demonstrated that COPS not only failed to add 100,000 additional officers to America’s streets but was ineffective at reducing crime. When Congress subsidizes local police departments in this manner, it effectively reassigns to the federal government the powers and responsibilities that fall squarely within the expertise, historical control, and constitutional authority of state and local governments. The responsibility to combat ordinary crime at the local level belongs wholly and exclusively to state and local governments. The COPS program has an extensive track record of poor performance and should be eliminated. These grants also unnecessarily perform functions that are the responsibility of state and local governments. For this particular program, the House Appropriations Committee made a fiscally wise decision that follows the wisdom of our founders and core principles of our government. When the bill is considered by the entire House, hopefully the majority of Representatives will exercise the same fiscal discipline. Republicans for more food stamps? Why can’t we cut the Food Stamp budget? Why not cancel the foodstamp program and let the churches step in? Where does Mark Pryor stand on gun control? 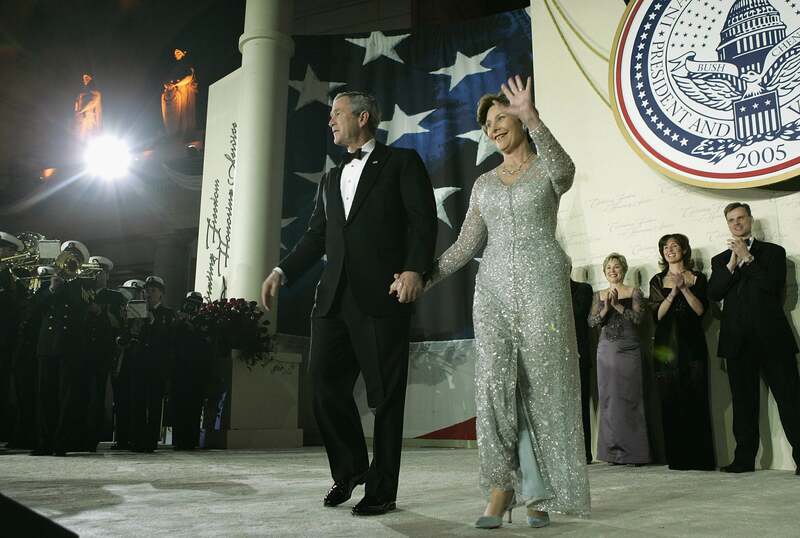 The government’s budget deficit in 2009 was $1.5 trillion. Many have suggested raising taxes on the rich to cover the difference between what the government collected in revenue and what it spent. Is that a realistic solution? Economics professor Antony Davies uses data to demonstrate why taxing the rich will not be sufficient to make the budget deficit disappear. He says, “The budget deficit is so large that there simply aren’t enough rich people to tax to raise enough to balance the budget.” Instead, it’s time to work on legitimate solutions, like cutting spending. 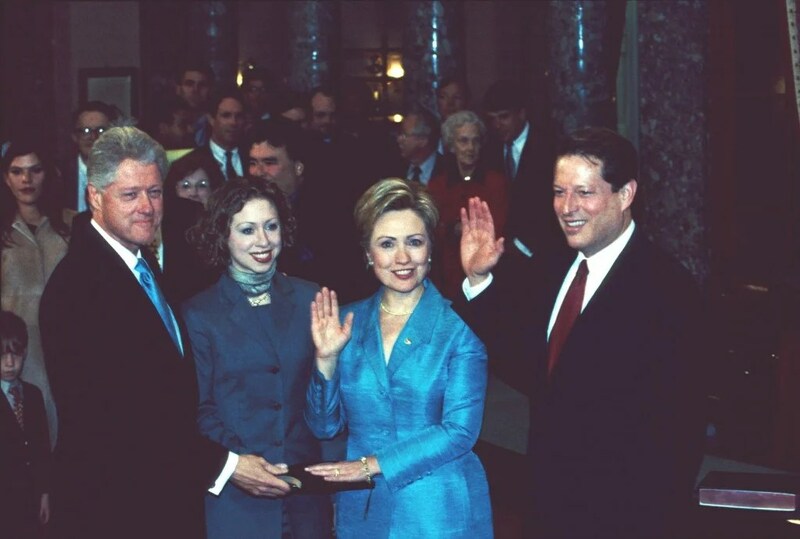 President Clinton is the favorite president that the Democrats want to talk about today but it seems they forget some of the details of what he actually did in office. 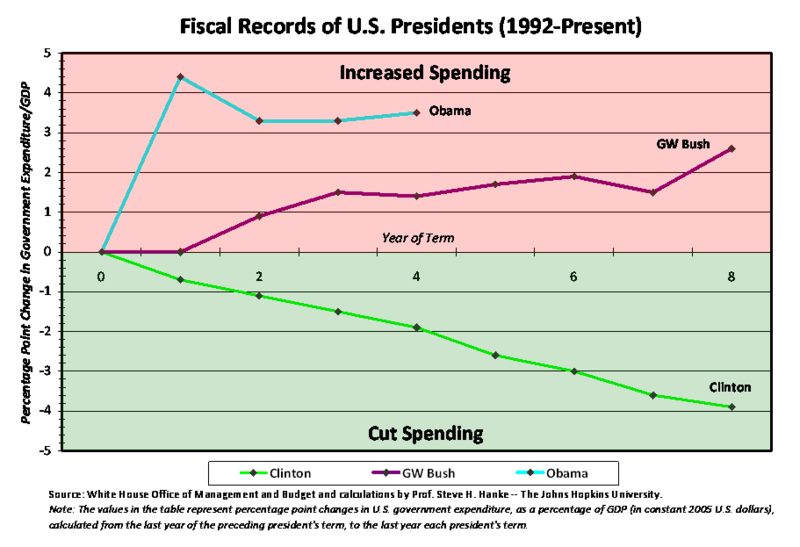 Fiscal Cliff: Clinton-Era Spending Levels, Anyone? Many are proposing that tax rates for upper-income earners go back to their levels during the Clinton Administration. What you don’t hear is how we can return to Clinton-era spending levels. That would be a real solution to the upcoming fiscal crisis, and the President could lead the way. The President says he wants Clinton-era marginal tax levels for families and small businesses earning more than $250,000 a year ($200,000 for individuals). However, tax rates for these earners would actually go up much more because of Obamacare tax hikes already signed into law. Never mind that this would slow growth and hurt job creation. And no, these tax hikes won’t balance the budget—not next year, not the year after, not ever. Under Obama’s budget, federal debt would continue growing by $7.7 trillion even if the President gets his favorite tax hikes. The debate over tax hikes is just a distraction from what is really going on: Washington has a spending problem, not a revenue problem, and President Obama is at the helm. According to the White House Office of Management and Budget, President Obama’s two-term average spending level is projected at 23.4 percent of gross domestic product (GDP). In comparison, President Clinton’s historical spending average was 19.9 percent of GDP. While revenues are set to return to historical average levels of over 18.1 percent as the economy slowly recovers, spending under current policy is projected to remain well above the historical average of 20.2 percent. The solution to America’s spending-driven debt crisis is as clear as daylight: Lawmakers must cut spending today and in the future. The Heritage Foundation has a plan, Saving the American Dream, which shows how lawmakers can balance the budget in less than 10 years and reduce the debt by tackling the main drivers of federal spending—entitlements. [T]he President must adopt the mantle of leadership, rather than brinksmanship, to steer the nation away from the fiscal cliff and all that is set to follow, and he must start with spending. However, the critical silver lining is that simple, commonsense, and thoroughly vetted solutions…constitute a strong start on the journey to more complete programmatic reforms remedying acknowledged flaws in these programs, and they already enjoy broad support across the political spectrum. Click here to see the full list of proposals to avoid the fiscal cliff and avert the upcoming fiscal crisis. 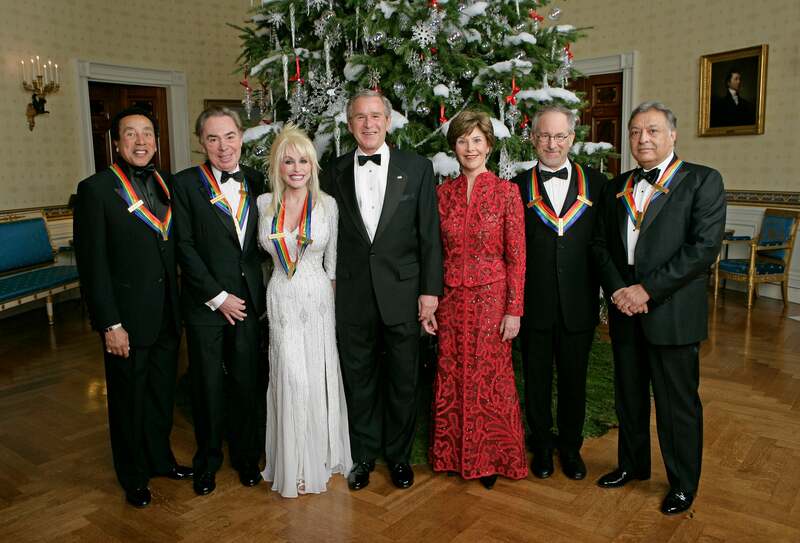 President Reagan, Nancy Reagan, Tom Selleck, Dudley Moore, Lucille Ball at a Tribute to Bob Hope’s 80th birthday at the Kennedy Center. 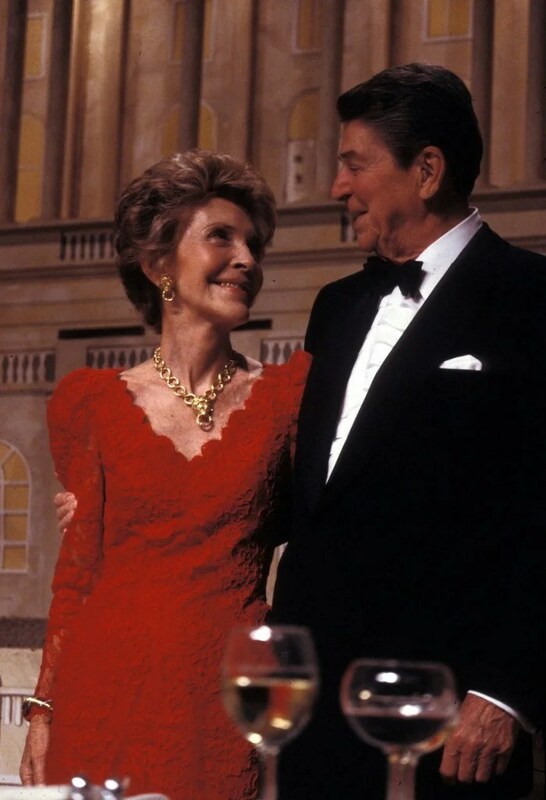 5/20/83. Dan Mitchell is very good at giving speeches and making it very simple to understand economic policy and how it affects a nation. Mitchell also talks about slowing the growth of government and he gives credit to Clinton and Reagan. Probably my favorite subject that Dan has covered is the Laffer Curve. I got a chance to hear Arthur Laffer speak at Memphis St University in 1981 and Laffer actually predicted what would happen in the next 7 years because of the Reagan Tax Cuts and all of his predictions came true. 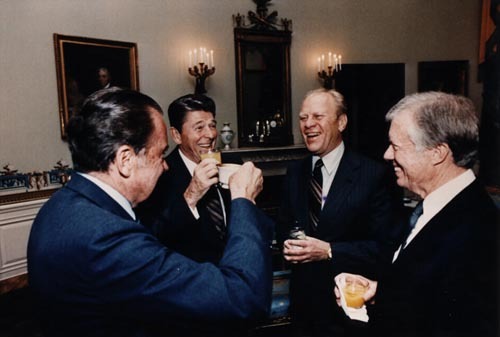 What did we learn from the Laffer Curve in the 1980′s? Lowering top tax rate from 70% to 28% from 1980 to 1988 and those earning over $200,000 paid 99 billion in taxes instead of 19 billion!!!! The funny thing is that the world saw what we did and followed along. The drop of the industrialized countries during this same time was 26% (from 68% to 42% on average). It reminded me of Milton Friedman 1980 book “Free to Choose” and his answer to the 11% inflation that President Carter was dealing with in 1980. Reagan put Friedman’s solution into action and 5 years later inflation was under control. Below is a fine article and video from Dan Mitchell. I’ve narrated a video that cites Economic Freedom of the World data to explain the five major factors that determine economic performance. But that video is only six minutes long, so I only skim the surface. For those of you who feel that you’re missing out, you can listen to me pontificate on public policy and growth for more than sixty minutes in this video of a class I taught at the Citadel in South Carolina (and if you’re a glutton for punishment, there’s also nearly an hour of Q&A). There are two points that are worth some additional attention. 1. In my discussion of regulation, I mention that health and safety rules can actually cause needless deaths by undermining economic performance. I elaborated on this topic when I waded into the election-season debateabout whether Obama supporters were right to accuse Romney of causing a worker’s premature death. 2. In my discussion of deficits and debt, I criticize the Congressional Budget Office for assuming that government fiscal balance is the key determinant of economic growth. And since CBO assumes you maximize growth by somehow having large surpluses, the bureaucrats actually argue that higher taxes are good for growth and their analysis implies that the growth-maximizing tax rate is 100 percent. P.S. If you prefer much shorter doses of Dan Mitchell, you can watch my one-minute videos on tax reform that were produced by the Heartland Institute. The government can cut roughly $343 billion from the federal budget and they can do so immediately. The stimulus program did not help, but getting government out of the way would!!!! Take a look at this great article that goes over several examples through history. The Orpheum Film Series will present a special laughs-and-scares double-feature for Halloween, featuring both James Whale’s original 1931 “FRANKENSTEIN” and Mel Brooks’ 1974 send-up, “YOUNG FRANKENSTEIN”. The fun starts at 7pm on Halloween night, October 31! 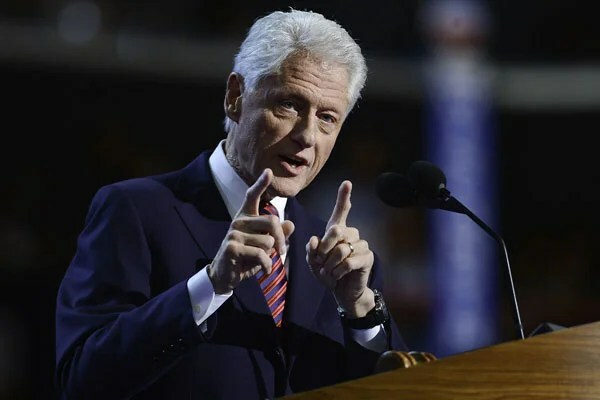 Bill Clinton likes the 2007 comedy ‘Who’s Your Caddy?’ (Photo: Everett/Getty)With an appalling six percent rating on Rotten Tomatoes, it garnered jeers far and wide from film critics. 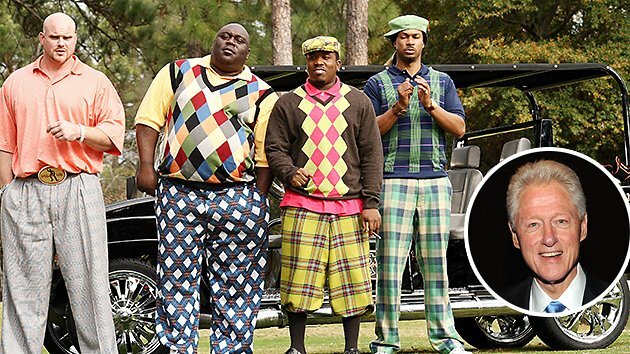 But that didn’t stop Bill Clinton from watching — and re-watching — the zany R-rated comedy “Who’s Your Caddy?” starring rappers Lil Wayne and Big Boi. Former President Clinton watched the 2007 golf-themed movie on a plane to Thailand. “I’m such an ardent moviegoer. I try to see everything,” he told Ebert in ’99. And judging from Clinton’s multiple “Who’s Your Caddy?” viewings, he does in fact give everything in film a chance. 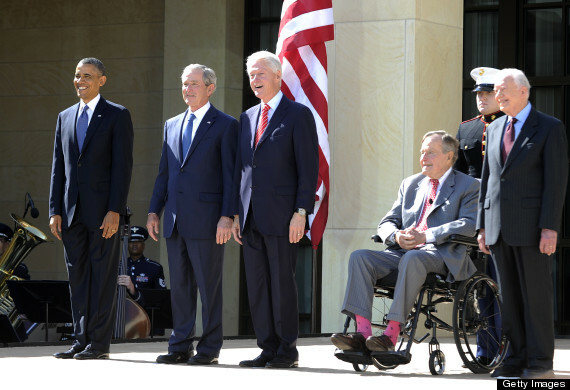 FIVE PRESIDENTS: At Bush Library opening. 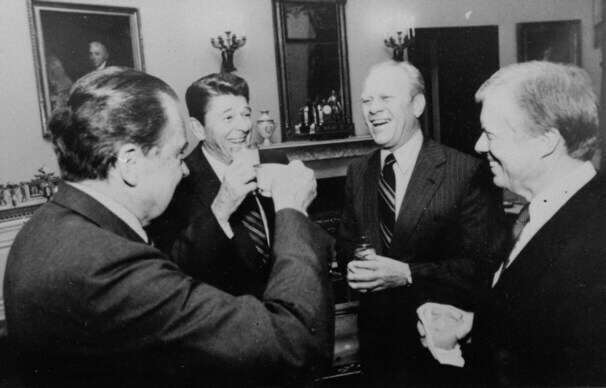 Here is the link for a picture of President Nixon’s funeral that has a picture of Reagan, Clinton, Bush, Ford and Carter. 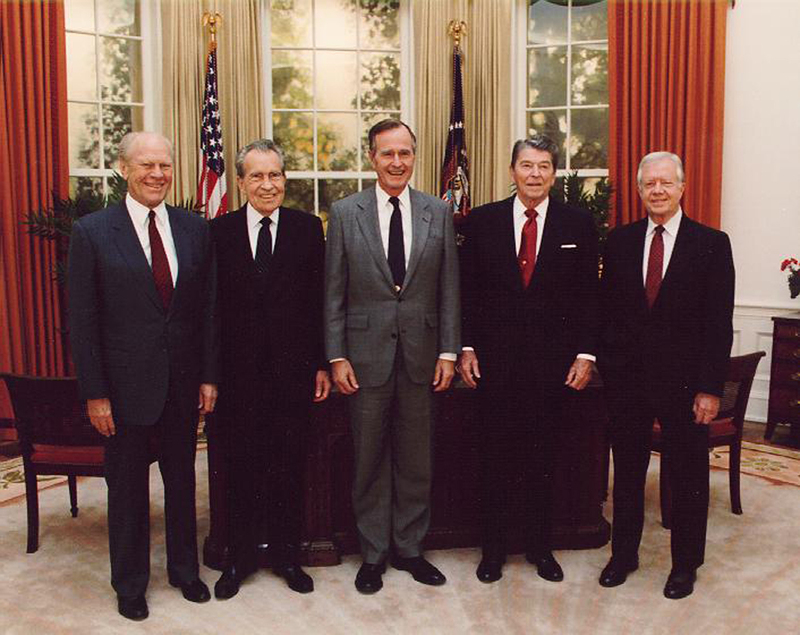 From 1981 we have 4 presidents together. It is hard for some liberals to believe but the Cato Institute on March 14, 2013 released an article praising Bill Clinton as the best at cutting spending. And the King of the Fiscal Squeeze Is…Bill Clinton? When Congressman Paul Ryan takes the stage at CPAC Friday morning, he will, of course, tout his new budget as a solution to America’s spending problem. The 2014 Ryan plan does aim to balance the budget in 10 years. That said, it would leave government spending, as a percent of GDP, at a hefty 19% – as my colleague, Daniel J. Mitchell, points out in his recent blog. Proposals like the Ryan budget are all well and good, but they are ultimately just that – proposals. If Congressman Ryan really wants to get serious about cutting spending, he should look to the one U.S. President who has squeezed the federal budget, and squeezed hard. So, who can Congressman Ryan look to for inspiration on how to actually cut spending? None other than President Bill Clinton. How can this be? To even say such a thing verges on CPAC blasphemy. Well, as usual, the data don’t lie. 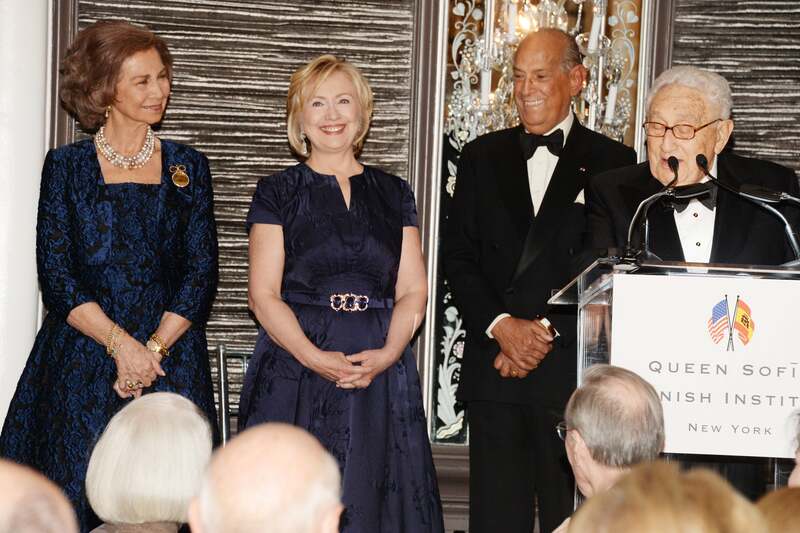 Let’s see how Clinton stacks up against Presidents Barack Obama and George W. Bush. As the accompanying chart shows, Clinton was the king of the fiscal squeeze. Yes, Bill Clinton cut government’s share of GDP by a whopping 3.9 percentage points over his eight years in office. 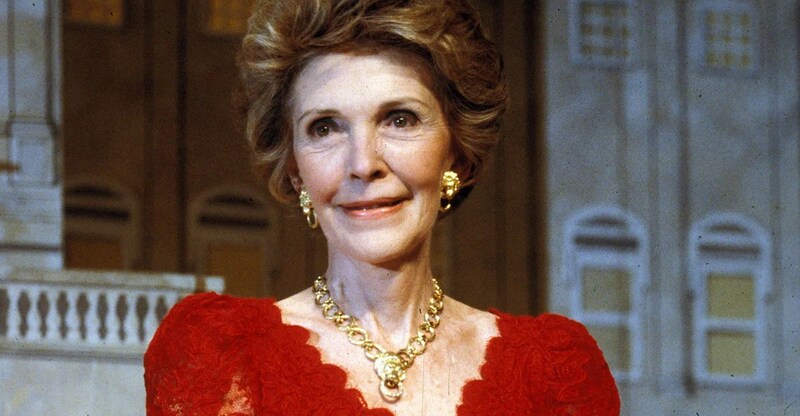 But, what about President Ronald Reagan? Surely the great champion of small government took a bite out of spending during his two terms, right? Well, yes, he did. But let’s put Reagan and Clinton head to head – a little fiscal discipline show-down, if you will (see the accompanying chart). 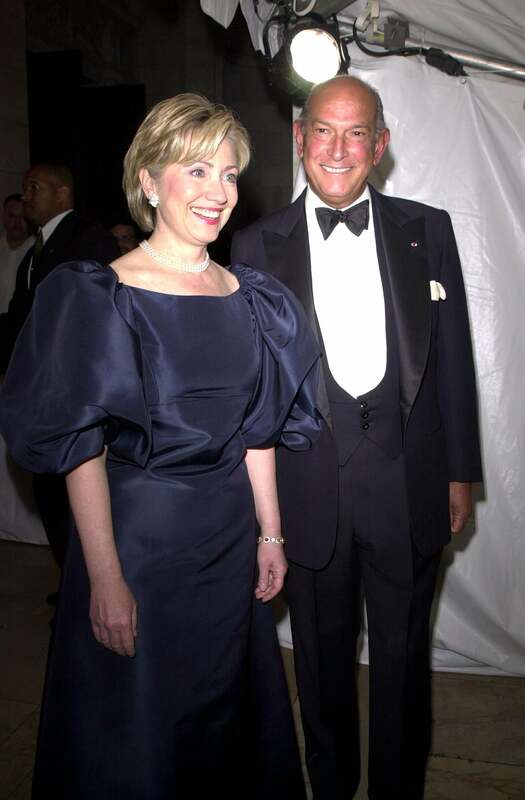 And the winner is….Bill Clinton. While Reagan did lop off four-tenths of a percentage point of government spending, as a percent of GDP, it simply does not match up to the Clinton fiscal squeeze. 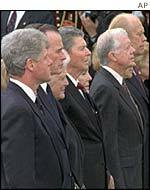 When President Clinton took office in 1993, government expenditures accounted for 22.1% of GDP. At the end of his second term, President Clinton’s big squeeze left the size of government, as a percent of GDP, at 18.2%. Since 1952, no other president has even come close. Some might argue that Clinton was the beneficiary of the so-called “peace dividend,” whereby the post-Cold-War military drawdown led to a reduction in defense expenditures. The problem with this explanation is that the majority of Clinton’s cuts came from non-defense expenditures (see the accompanying table). Admittedly, Clinton did benefit from the peace dividend, but the defense drawdown simply doesn’t match up to the cuts in non-defense expenditures that we saw under Clinton. Of course, it should be noted that the driving force behind many of these non-defense cuts came from the other side of the aisle, under the leadership of Speaker Gingrich. The jury is still out on whether Ryan (or Boehner) will prove to be a Gingrich – or Obama, a Clinton. But, at the end of the day, the presidential scoreboard is clear – Clinton is the king of the fiscal squeeze.